Investigators found a human head, along with other body parts and limbs, along with three pairs of empty shoes - poachers killed by lions. 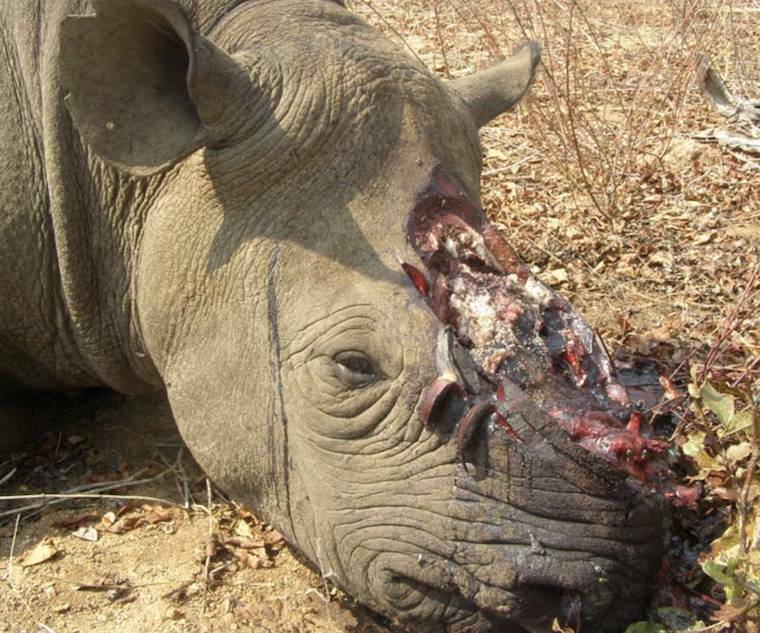 Rhino murdered for his horn... Image from AnimalsVoice.com. At least three suspected poachers were apparently killed by lions while hunting rhinos at a South Africa wildlife reserve. Rangers found human remains Tuesday at Sibuya Game Reserve, and police returned the following morning to look for poachers, reported the Sunday Times. Investigators found a human head, along with other body parts and limbs, along with three pairs of empty shoes, according to the Daily Mail. A rifle and an ax were also found at the lion camp. Police have not identified the slain humans, and they’re testing the rifle to determine whether they were poachers. Nine rhinos have been shot and killed by poachers so far this year on Eastern Cape reserves. Three white rhinos were killed by poachers at Sibuya in June 2016, and three rhinos were killed in May at the nearby Port Alfred Nature Reserves.